The number of patients in England waiting to be admitted to hospital fell sharply in February, official figures show. Figures released by the Department of Health showed the number fell to 845,200, a drop of 17,000 from January. The data showed 46 patients had waited more than nine months for an operation. However, opposition parties said the figures did not take into account the time patients waited to see a consultant for the first time. 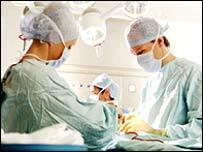 February is traditionally one of the busiest months for the NHS. The total number of patients waiting was 10% lower than in 2004. The number of patients waiting over six months at the end of February was 60,400, a fall of 8,800 from January, and a fall of 47% from February 2004. The government has pledged that no one will be waiting more than six months for hospital treatment by the end of the year. Health Secretary John Reid added: "Thanks to the hard work and dedication of NHS staff, patients are getting speedier operations than ever before." Shadow Health Secretary Andrew Lansley said: "Today's statistics only give half the picture. "There are still over a million people in the UK waiting for NHS treatment. "Average waiting times have increased since 1999 and many patients suffer on hidden waiting lists, not included in Mr Blair's targets." Paul Burstow, Liberal Democrat health spokesman, said the government was being "complacent". "The claim that few patients are waiting over nine months will not ring true for those patients languishing on hidden waiting lists before they even show up on the official lists."